Roll up the bottoms when you have your street shoes on to travel up and down the mountain, otherwise they will drag on the ground and wear out. Wear your ski pants when travelling to the mountain, that way you are ready to go as soon as you arrive. Get the size right. When buying or renting make sure you have enough room to fit thermals underneath and so you’re able to bend and move around comfortably. Wear jeans under them. They will get wet from sweat, they don’t keep you warm and they will be restricting. Let the bottoms drag when you have your street shoes on. Leave your zips undone if you put things in your pocket. #1 Leg Vents. These are like the pit zip feature from last week. They allow you to cool down without having to take layers off. They are normally located on the inner leg. #2 Adjustable Waist Band. This is just as it sounds and is generally velcro. It allows minor adjustments to the waist size and is awesome! It also allows you to get just the right fit depending on the layers you are wearing underneath. And means you don’t have to wear a bulky belt. Stoked. #3 Pockets. From last weeks ski jacket blog, you will know that I love pockets and I love them in pants too! My favourite is a pocket that is sometimes found on the bottom of your leg at boot level! It’s great for your phone or money! 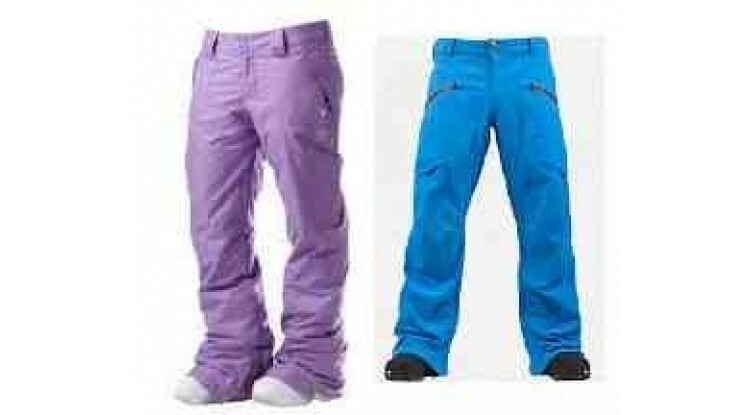 Again as we mentioned last blog your snow pant must be waterproof and breathable! So now you have some do’s and don’ts when it comes to ski or snowboard pants and know my favourite features to look for. Hopefully that will give you a good quick insight to help you start. Most importantly of all, make sure you love them and feel good wearing them. So key!